Sessions and panel discussions will explore topics such as “Community Planning in Shaping the City” and “Vision & Implementation in Community Practice” will feature speakers offering both a Hong Kong and Amsterdam perspective. 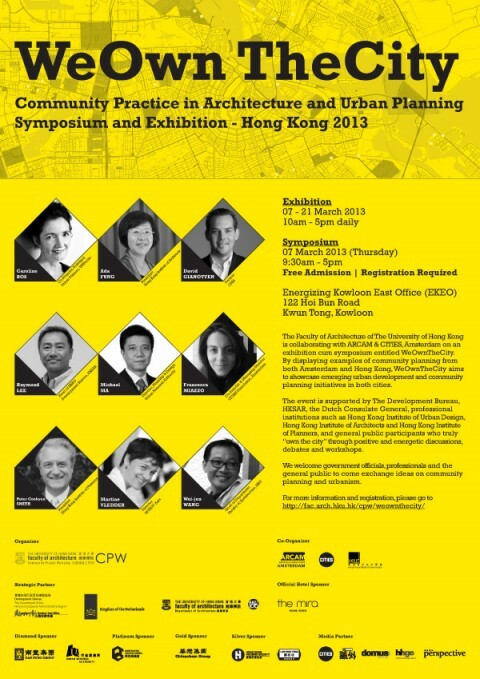 Speakers include Caroline Bos, co-founder of the Amsterdam-Shanghai-Hong Kong based UNStudio, Ada Fung of the Hong Kong Institute of Architects and Michael Ma, the Director of Planning & Design and the Urban Renewal Authority of Hong Kong. The event is supported by the Development Bureau, HKSAR, the Dutch Consulate General, professional institutions such as the Hong Kong Institute of Urban Design, Hong Kong Institute of Architects and Hong Kong Institute of Planners. The symposium and exhibition are free and open to the public. Please register if you wish to attend the March 7th symposium.